^ a b "もはや死者数の推計は不可能、シリア騒乱で国連". ロイター. 2012-05-26. Retrieved 2012-05-30. ^ "Syria funeral hit with teargas, protesters wounded: report". Agence France-Presse (via Google News). 19 March 2011. Retrieved 19 March 2011. 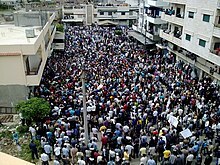 ^ a b "Syrian Protests Add to Pressure on Assad Regime". The Wall Street Journal. 23 March 2011. Retrieved 23 March 2011. ^ "UN Chief Slams Syria's Crackdown on Protests". Al Jazeera English. 18 March 2011. ^ "17 dead as al-Qaeda loyalists attack Syrian Kurds in Turkish border town of Ras al-Ain". Hurriyet. 2013-08-17. Retrieved 2013-08-18. ^ "シリア軍がアレッポで大規模掃討、反体制派の撤退情報も". ロイター. 2012-08-09. Retrieved 2012-10-10. ^ "シリア:北部で200人死亡…8日間攻防 市民の犠牲増加". 『毎日新聞』. 2013-03-03. Archived from the original on 2013-05-01. Retrieved 2013-03-06. ^ "Lebanon news - NOW Lebanon -Hashem: March 14 has â€œmalignantâ€? intent toward Syria". NOW Lebanon. 28 April 2011. Retrieved 8 May 2011. ^ "Lebanon news - NOW Lebanon -March 14 slams Hezbollah over Syria reports". NOW Lebanon. 15 April 2011. Retrieved 8 May 2011. ^ "Hezbollah is aiding false Syria campaign: March 14". Daily Star. Retrieved 8 May 2011. ^ "U.N. Says Action Needed to Prevent Civil War in Syria". ニューヨーク・タイムズ (in 英語). 2011-12-02. Retrieved 2012-06-02. ^ "「シリアは全面的な内戦状態に」、国連高官が初めて公言". ロイター. ロイター. 2012-06-13. Retrieved 2012-06-13. ^ "Syria (05/07)". State.gov. Retrieved 25 October 2008. ^ Wilson, Scott. "Syria escalates attacks against demonstrators". The Seattle Times. Retrieved 26 April 2011. ^ a b Talk of the Nation. "Protests In Syria Pose Challenges For The U.S." NPR. Retrieved 15 April 2011. ^ a b "Syria: Identity Crisis". The Atlantic. 30 March 1949. Retrieved 15 April 2011. ^ a b c Alexander, Anne (29 March 2011). "Syria protests: The forgotten decades of dissent". BBC News. Retrieved 15 April 2011. ^ Shadid, Anthony (26 April 2011). "International Outcry Grows Over Syria Crackdown". The New York Times. Retrieved 3 May 2011. ^ Ghadry, Farid N. (Winter 2005). "Syrian Reform: What Lies Beneath". Middle East Quarterly. Retrieved 27 June 2011. ^ Michael Bröning (7 March 2011). "The Sturdy House That Assad Built". The Foreign Affairs. Retrieved 27 June 2011. ^ Landler, Mark (26 March 2011). "Chaos in Syria and Jordan Alarms U.S." The New York Times. ^ "Hama". GlobalSecurity.org. Retrieved 14 November 2009. ^ a b George, Alan. Syria: neither bread nor freedom. 2003. p.115. ^ "Syria". State.gov. Retrieved 10 April 2011. ^ "Syria: Next on the list? A wave of unrest has finally reached one of the region's most repressive regimes". The Economist. 24 March 2011. Retrieved 1 April 2011. ^ Lee, Matthew. "US treads warily in Syria, considers sanctions". Associated Press (via Houston Chronicle). Retrieved 26 April 2011. ^ "Syria – International Religious Freedom Report 2006". U.S. Department of State. 2006. http://www.state.gov/g/drl/rls/irf/2006/71432.htm. Retrieved 28 June 2009. ^ "Syria Kurd leader vows to keep up democracy struggle". The Jerusalem Post. Retrieved 27 June 2011. ^ "US will not intervene in Syria as it has in Libya, says Hillary Clinton". The Guardian. 27 March 2011. ^ Saleeby, Suzanne (16 February 2012). "Sowing the Seeds of Dissent: Economic Grievances and the Syrian Social Contract's Unraveling". Jadaliyya. ^ "環境移民：数の問題ではない". 国際連合大学. 2011-07-21. Retrieved 2015-03-15. ^ "シリア内戦の原因は気候変動？ 最新の研究結果". ハフィントン・ポスト. 2015-03-04. Retrieved 2015-03-15. ^ "World Report 2010 Human Rights Watch World Report 2010", pg. 555. ^ a b c Human Rights Watch World Report 2005 Events of 2004, Human Rights Watch 2005. ISBN 1564323315. ^ Black, Ian (16 July 2010). "Syrian human rights record unchanged under Assad, report says". The Guardian. ^ Davies, Wyre (22 March 2009). "Syria protests: Rights group warns of 'Deraa massacre'". BBC News. Retrieved 8 May 2011. ^ "Who Are the Shabbiha?". The Weekly Standard. 12 April 2011. Retrieved 3 May 2011. ^ Ammar Abdulhamid (11 April 2011). "The Shabbiha: Assad's Mercenaries". Syrianrevolutiondigest.blogspot.com. Retrieved 3 May 2011. ^ "Forces Deploy in Syrian City Homs, People Defiant". Khaleej Times. 21 April 2011. Retrieved 3 May 2011. ^ "Bashar Al-Assad, President, Syria". Reporters Without Borders. Retrieved 27 June 2011. ^ "Interview With Syrian President Bashar al-Assad". The Wall Street Journal. Retrieved 31 January 2011. ^ "Syria Strongman: Time for 'Reform'". The Wall Street Journal. Retrieved 31 January 2011. ^ "Information on the death of a young man who burned himself in Al Hasakah". free-syria.com. Retrieved 30 January 2011. ^ "Syrian suicider is "Hasan Ali Akleh". Damascus has banned a demonstration in support of Egypt". metransparent.com. Retrieved 30 January 2011. ^ "Demonstration in Ar-Raqqa, Syria". free-syria.com. Retrieved 30 January 2011. ^ "'Day of Rage' Protest Urged in Syria". MSNBC. Retrieved 3 February 2011. ^ ""Day of Rage" planned for Syria; protests scheduled for Feb 4–5". aysor.am. Retrieved 3 February 2011. ^ Collier Jr., William R. (30 January 2011). "Syrian Anger Day Planned Feb 5, 2011". The Freedomist. Retrieved 31 January 2011. ^ "Syrian Anger Day Planned Feb 5, 2011 | The Freedomist". TOPSY. Retrieved 1 February 2011. ^ "Demonstration on the day of anger in Hasaka and Syrian authorities arrested dozens". free-syria.com. Retrieved 15 February 2011. ^ "Syria: 'A kingdom of silence'". Al Jazeera English. Retrieved 12 February 2011. ^ "Syria clamps down on dissent with beatings and arrests". The Guardian. 24 February 2011. Retrieved 24 February 2011. ^ "الاعتصام امام السفارة الليبية دمشق-22-شباط Part 5". YouTube. 24 February 2011. Retrieved 27 June 2011. ^ "الاعتصام امام السفارة الليبية دمشق-22-شباط Part 8". YouTube. 24 February 2011. Retrieved 27 June 2011. ^ "The Youth of Syria: The Rebels Are on Pause". TIME. Retrieved 6 March 2011. ^ "Is Syria the next domino?". Al Jazeera English. Retrieved 6 March 2011. ^ "Middle East unrest: Syria arrests Damascus protesters". BBC News. Retrieved 19 April 2011. ^ "Fresh Protests Erupt in Syria". The Epoch Times. Retrieved 15 March 2011. ^ "السوريون يكسرون جدار الخوف بالتظاهر في قلب دمشق". YouTube/Al Arabiya. Retrieved 15 March 2011. ^ "ردّدوا هتافات تدعو لمحاربة الفساد وفتح باب الحريات". Al Arabiya. Retrieved 15 March 2011. ^ "الاف السوريين يثورون في قلب دمشق و المحافظات مطالبين بالحرية". sawtbeirut.com. Retrieved 16 March 2011. ^ "مظاهرة شباب الثورة في تركيا". YouTube/Al Jazeera. Retrieved 16 March 2011. ^ "Clashes erupt at protests in Syria". Al Jazeera English. Retrieved 18 March 2011. ^ "Violence flares at Syrian protest". YouTube/Al Jazeera. Retrieved 18 March 2011. ^ "Middle East unrest: Two killed at protest in Syria". BBC News. 18 March 2011. Retrieved 18 March 2011. ^ a b Al-Jazeera (20 March 2011). "Syria to free child prisoners". Retrieved 20 March 2011. ^ "Syrian protesters set fire to ruling party's headquarters, Palace of Justice". The Globe and Mail. ^ "US condemns Syria crackdown". Irish Times. 22 March 2011. Retrieved 22 March 2011. ^ "Protests spread to southern Syrian town Jassem". Ya Libnan. 21 March 2011. Retrieved 21 March 2011. ^ "Officers Fire on Crowd as Syrian Protests Grow". The New York Times. 20 March 2011. Retrieved 10 April 2011. ^ "15 Killed in Clashes in Southern Syria". Chicago Sun-Times. 23 March 2011. Retrieved 23 March 2011. ^ "Syrian Troops Open Fire on Protesters in Several Cities". Reuters. 25 March 2011. Retrieved 10 April 2011. ^ a b c "In Syrian flashpoint town, more deaths reported". CNN. 25 March 2011. Retrieved 25 March 2011. ^ "Security Forces 'Kill 20 Protesters' In Syria". Sky News. 25 March 2011. Retrieved 25 March 2011. ^ a b "Syrian protesters target Baath Party offices". Al Jazeera English. 26 March 2011. Retrieved 26 March 2011. ^ a b "At Least 23 Said Killed as Protesters in Syria Clash with Security Forces". Haaretz. 25 March 2011. Retrieved 26 March 2011. ^ "Deaths as Syrian forces fire on protesters". Al Jazeera English. 26 March 2011. Retrieved 26 March 2011. ^ a b "25 March 2011 Syrian Protests". AFP/NOW Lebanon. 25 March 2011. Retrieved 25 March 2011. ^ a b c "Troops Open Fire on Syrian Protesters". The Wall Street Journal. 25 March 2011. Retrieved 25 March 2011. ^ a b c "Syria – Protests (2011)". The New York Times. Retrieved 10 April 2011. ^ a b Al-Jazeera English (27 March 2011). "Syria 'to lift emergency law'". Retrieved 27 March 2011. ^ a b "Assad supporters 'loyal to nation'". 29 March 2011. Retrieved 29 March 2011. ^ a b "Syrian cabinet resigns amid unrest". aljazeera.net. 29 March 2011. Retrieved 15 April 2011. ^ "شام – مفتي سوريا يعلن نتائج التحقيقات في أحداث درعا". Al Jazeera/YouTube. 26 March 2011. Retrieved 10 April 2011. ^ "Syria unrest: Pro-Assad rallies in Damascus and Aleppo". BBC News. 29 March 2011. Retrieved 29 March 2011. ^ "Mass Popular Rallies Prevail Syrian Provinces in Support of National Unity, Security and Stability". DP-News. 29 March 2011. Retrieved 10 April 2011. ^ "Syria's Assad warns of 'conspiracy' – Middle East – Al Jazeera English". English.aljazeera.net. 31 March 2011. Retrieved 10 April 2011. ^ "الهجوم على سيارة بشار الاسد بعد خطاب". CNN/YouTube. 30 March 2011. Retrieved 10 April 2011. 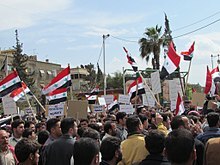 ^ "Protests in Latakia after Assad Speech – Residents". Reuters. Retrieved 10 April 2011. ^ "Syrian police fire at protesters in Latakia | Arabic region | Trend". En.trend.az. 30 March 2011. Retrieved 10 April 2011. ^ "Assad issues decree to raise wages". NOW Lebanon. 31 March 2011. Retrieved 10 April 2011. ^ "At least 10 killed in Syria". Ynetnews.com. 20 June 1995. Retrieved 10 April 2011. ^ Stack, Liam; Goodman, J. David (1 April 2011). "Syrian Protesters Clash With Security Forces". The New York Times. Retrieved 1 April 2011. ^ "Syria: 1 April 2011". AFP /NOW Lebanon. 1 April 2011. Retrieved 1 April 2011. ^ Brown, Cameron S. "Erdogan says he will press Syria's Assad to reform". The Jerusalem Post. Retrieved 10 April 2011. ^ "Bashar Assad Appoints Adel Safar New PM of Syria". The Australian. 4 April 2011. Retrieved 3 April 2011. Syrian President Bashar Assad last night asked former agriculture minister Adel Safar to form a new government, as communications networks failed and residents in Douma prepared to bury the first of their dead. ^ a b "Syria Reverses Ban on Islamic Face Veil in Schools". Associated Press (via Forbes). 6 April 2011. Archived from the original on 9 April 2011. Retrieved 6 April 2011. ^ "Many Kurds Will Be Granted Syrian Citizenship, As-Safir reports". Agence France-Presse (via NOW Lebanon). 5 April 2011. Retrieved 6 April 2011. ^ Katherine Marsh in Damascus. "Syria's biggest day of unrest yet sees at least 20 people killed". The Guardian. Retrieved 10 April 2011. ^ a b "Protesters killed in southern Syria". Al Jazeera English. 9 April 2011. Retrieved 9 April 2011. ^ "Syria: government troops in violent reaction to fresh protests". The Daily Telegraph. 8 April 2011. Retrieved 27 June 2011. ^ Press Association (15 April 2011). "Thousands demand Syria reforms". Retrieved 15 April 2011. ^ a b Al-Jazeera English (15 April 2011). "Thousands take to streets in Syria protests". Retrieved 15 April 2011. ^ "Live Blog: Middle East protests April 15". Al Jazeera. 15 April 2011. Retrieved 20 April 2011. ^ Sands, Phil (15 April 2011). "Syria president appoints new government, orders protesters freed from jail". The National. Retrieved 15 April 2011. ^ a b "Syria to lift emergency law". 16 April 2011. Retrieved 17 April 2011. ^ a b "Syria 'lifts emergency law' amid protests". Al Jazeera English. 19 April 2011. Retrieved 19 April 2011. ^ a b "Decrees on Ending State of Emergency, Abolishing SSSC, Regulating Right to Peaceful Demonstration". Syrian Arab News Agency. 22 April 2011. Retrieved 23 April 2011. ^ a b Khaled Yacoub Oweis, additional reporting by Mariam Karouny in Beirut; Suleiman al-Khalidi in Amman; Sami Aboudi in Cairo; writing by Yara Bayoumy; editing by Samia Nakhoul and Paul Taylor (21 April 2011). "Syria's Assad ends state of emergency". Reuters. Retrieved 21 April 2011. ^ "Deadly Syria Protests: Highest Death Toll Reported as Syrian Forces Fire Into Crowd". ABC News. 22 April 2011. Retrieved 22 April 2011. ^ a b Shadid, Anthony (22 April 2011). "Test of Wills in Syria as Forces Open Fire in Several Cities". The New York Times. Retrieved 22 April 2011. ^ "Syrian security forces shoot protesters". Al Jazeera. 22 April 2011. Retrieved 22 April 2011. ^ Shadid, Anthony (23 April 2011). "Syrian Security Forces Fire on Mourners in Several Towns". The New York Times. Retrieved 23 April 2011. ^ UKPA, Google (23 April 2011). "Syrian death toll 'reaches 120'". The Press Association. Retrieved 24 April 2011. ^ "'Nine killed' at Syria funeral processions". Al Jazeera. Retrieved 26 April 2011. ^ "Syria-news". Syria-news. Retrieved 26 April 2011. ^ "Syrian Forces Raid Homes as al-Assad Opposition Mounts". Reuters. 23 April 2011. Retrieved 24 April 2011. ^ Shadid, Anthony (24 April 2011). "More Syrians Missing, Hinting at Wider Crackdown". The New York Times. Retrieved 24 April 2011. ^ a b Shadid, Anthony (25 April 2011). "Syria Escalates Crackdown as Tanks Go to Restive City". The New York Times. Retrieved 26 April 2011. ^ "Syria seals border with Jordan: Amman". AFP. 25 April 2011. Retrieved 26 April 2011. ^ Carter, Chelsea (25 April 2011). "Deadly attack on protesters raises questions about Syria's stability". CNN. Retrieved 26 April 2011. ^ "Obama Condemns Syria for 'Outrageous' Violence". Voice of America. 22 April 2011. Retrieved 23 April 2011. ^ Charbonneau, Louis (25 April 2011). "EU Powers Push U.N. Council To Condemn Syria". Reuters. Retrieved 26 April 2011. ^ Barry Neild and agencies. "Syrian regime's attacks on protesters escalate". The Guardian. Retrieved 26 April 2011. ^ "Syria Live Blog - April 28". Al Jazeera English. 28 April 2011. Retrieved 28 April 2011. ^ "Scores killed on Syria's 'day of rage'". Al Jazeera English. 29 April 2011. Retrieved 30 April 2011. ^ "Syrian forces kill 62 as America tightens sanctions". Gulf News. 30 April 2011. Retrieved 30 April 2011. ^ "Obama Condemns 'Outrageous' Syria Violence, Iran Aid". Agence France-Presse (via Google News). Retrieved 27 April 2011. ^ "US Says It Has Evidence of Iran's Support for Syrian Government Crackdown on Protesters". Associated Press (via The Washington Post). Retrieved 27 April 2011. ^ "Iran denies supporting Syria in dealing with protestors". tehran times. 19 April 2011. Retrieved 27 April 2011. ^ "Thousands Of Syrians Amass Near City Of Deraa". Sky News. 6 May 2011. Retrieved 7 May 2011. ^ amerawad111. "Syria Live Blog&nbps;– May 6". Al Jazeera. Retrieved 8 May 2011. ^ "Syria: activists forced into hiding by threats". Amnesty International. 6 May 2011. Retrieved 7 May 2011. ^ "シリア: 抗議行動が続き、逮捕者が急増". Amnesty International. 6 May 2011. Retrieved 15 June 2011. ^ "Child Reported Killed as Syrian Forces Crack Down". MSNBC. 8 May 2011. Retrieved 9 May 2011. ^ "シリア非難の決議案、英仏独など欧州4カ国が安保理に提示". ロイター. ロイター. 2011-06-09. Retrieved 2011-06-30. ^ "米政府がシリアの弾圧非難、英仏独など提出の決議案を支持". ロイター. ロイター. 2011-06-11. Retrieved 2011-06-30. ^ "シリア政権党支部にロケット弾…離反兵組織声明". 2011-11-20. Archived from the original on 2011-11-22. Retrieved 2011-11-20. ^ "シリア首相、政権から離反表明…反体制派に参加". 讀賣新聞. 2012-08-06. Retrieved 2012-08-06. ^ "Assad names Wael al-Halqi as Syria's new prime minister". Press TV. 2012-08-09. Retrieved 2012-08-10. ^ "パキスタン・カル外相、外部からのシリア介入に反対の意向表明". EMEye 新興国情報. 2012-08-10. Retrieved 2012-08-11. ^ "シリア:国境でヨルダンと砲撃戦". 毎日新聞. 2012-08-11. Retrieved 2012-08-11. ^ "英、シリアの反体制派に6億円相当の支援". NNNニュース. 2012-08-11. Retrieved 2014-07-20. ^ "Syrian army fends off attack on Aleppo airport". Oman Tribune. 2012-08-11. Retrieved 2012-08-12. ^ "クリントン国務長官：米国はシリアの反対派にさらに550万ドル支援". ロシアの声. 2012-08-12. Retrieved 2012-08-13. ^ "アレッポのテレビ局で攻防 政府軍が増強". 産経新聞. 2012-08-04. Retrieved 2012-08-13. ^ "Senior Syrian terrorist eliminated". Voice of Russia. 2012-08-12. Retrieved 2012-08-13. ^ "シリアの加盟資格停止を決定 イスラム協力機構". 日本経済新聞. 2012-08-16. Retrieved 2012-08-16. ^ "OIC suspends Syria". Khaleej Times. 2012-08-17. Retrieved 2012-08-26. ^ "シリア:ブラヒミ氏が国連「特別代表」に 安保理協力要請". 毎日新聞. 2012-08-18. Retrieved 2012-08-18. ^ "シリア政府 反体制派との政治対話に同意". 中国国際放送. 2012-08-22. Retrieved 2012-08-22. ^ "アサド退陣、協議の用意＝訪ロのシリア副首相が言及". 時事通信. 2012-08-22. Retrieved 2012-08-22. ^ "国連シリア監視団団長、シリアを離れる". 中国国際放送. 2012-08-25. Retrieved 2012-08-26. ^ "シリアからの難民 21万人超える". NHK. 2012-08-29. Retrieved 2012-08-29. ^ "シリア支援:「同じ方向で」 国連でブラヒミ氏". 毎日新聞. 2012-09-05. Retrieved 2012-09-05. ^ a b c "シリア:国連特別代表とエジプト大統領ら打開策を協議". 毎日新聞. 2012-09-10. Retrieved 2012-09-11. ^ "Egypt confirms regional meeting on Syria in Cairo". AFP. 2012-09-10. Retrieved 2012-09-11. ^ "PM meets Brahimi and al-Arabi". Gulf Times. 2012-09-13. Retrieved 2012-09-13. ^ "Visiting Lebanon, pope denounces arms transfers to Syria". Los Angels Times. 2012-09-15. Retrieved 2012-09-15. ^ "President al-Assad Receives UN Envoy to Syria Lakhdar Brahimi". Syrian Arab News Agancy. 2012-09-15. Retrieved 2012-09-15. ^ "イラン、シリアに部隊派遣 革命防衛隊が非軍事的支援". 日本経済新聞. 2012-09-16. Retrieved 2012-09-17. ^ "Foreign Jihadists are escalating conflict in Syria, UN warns". Haaretz. 2012-09-17. Retrieved 2012-09-18. ^ "イスラム4カ国:シリア協議にサウジ欠席…初の外相会合". 毎日新聞. 2012-09-18. Retrieved 2012-09-19. ^ "シリアのアサド大統領、イラン外相と会談". 中国国際放送. 2012-09-20. Retrieved 2012-09-20. ^ "首都ダマスカス近郊でヘリ墜落 反体制派が撃墜主張". 産経新聞. 2012-09-20. Retrieved 2012-09-20. ^ "Free Syrian Army 'move command centre inside Syria'". BBC NEWS. 2012-09-22. Retrieved 2012-09-22. ^ "平和的な政権打倒で合意 シリアで反体制派会議". 産経新聞. 2012-09-24. Retrieved 2012-09-24. ^ "Syrian opposition kick off "national conference" with absence of many parties". Xinhua. 2012-09-23. Retrieved 2012-09-24. ^ "Syrian opposition calls for Assad's 'peaceful overthrow' at Damascus summit". Russia Today. 2012-09-24. Retrieved 2012-09-24. ^ "قطر تدعو للتدخل بسوريا وفرنسا للحماية". Al Jazeera.net. 2012-09-26. Retrieved 2012-09-26. ^ "Morsi opposes foreign intervention in Syria". Ahramonline. 2012-09-25. Retrieved 2012-09-26. ^ "Official: Hezbollah fighters killed in Syria". The Daily Star. 2012-10-02. Retrieved 2012-10-03. ^ "国連とアラブ連盟のシリア担当代表、来週活動開始". 中国国際放送. 2012-10-03. Retrieved 2012-10-04. ^ "シリア主要都市で車爆弾3件、多数死傷 自爆攻撃が激化か". CNN.co.jp. 2012-10-04. Retrieved 2012-10-04. ^ "トルコ:シリアから再び砲弾 直後に軍が報復攻撃". 2012-10-06. Retrieved 2012-10-06. ^ 今村実 (2012-10-10). "アルカイダ系勢力活発化 シリア 自爆攻撃を多用、大量処刑も". 東京新聞. Retrieved 2012-10-10. ^ "国連シリア特使、サウジアラビア国王と会談". 中国国際放送. 2012-10-13. Retrieved 2012-10-14. ^ "Three jihadists arrested near Syrian border". The Jordan Times. 2012-10-18. Retrieved 2012-10-18. ^ "「犠牲祭」停戦案、ブラヒミ氏とシリア外相会談". 讀賣新聞. 2012-10-20. Retrieved 2012-10-21. ^ "トルコ外相 犠牲祭期間中の停戦を呼びかけ". 中国国際放送. 2012-10-19. Retrieved 2012-10-21. ^ "犠牲祭期間中の停戦 シリアへ呼びかけ". NHK. 2012-10-18. Retrieved 2012-10-21. ^ "シリア:首都ダマスカスで爆弾爆発 13人が死亡". 毎日新聞. 2012-10-21. Retrieved 2012-10-22. ^ "シリア:停戦崩壊 ブラヒミ特別代表は新提案の考え". 2012-10-29. Retrieved 2012-10-29. ^ "シリア反体制連合を承認＝武器提供も検討－仏". 時事ドットコム. 時事通信. 2012-11-14. Retrieved 2012-11-15. ^ "「シリア国民連合」、唯一の代表に承認 国際会合". AFPBB News. 2012-12-13. Retrieved 2012-12-20. ^ "「軍事解決は困難」 副大統領 国民的対話を強調". しんぶん赤旗. 2012-12-19. Retrieved 2012-12-20. ^ "シリア憲兵隊司令官が離反 反体制派に合流と宣言". 産経新聞. 2012-12-26. Retrieved 2012-12-26. ^ "سوريا: انشقاق قائد الشرطة العسكرية". BBC ARABIC. 2012-12-26. Retrieved 2012-12-26. ^ "シリア首都で連続テロ 53人以上死亡". 産経新聞. 2013-02-21. Retrieved 2013-03-07. ^ "暫定政府を設置へ＝シリア反体制派". 時事通信. 2013-02-23. Retrieved 2013-03-07. ^ "アメリカ シリア反体制派に巨額支援". 中国国際放送. 2013-03-01. Retrieved 2013-03-07. ^ "シリア難民、100万人に 国連が支援呼びかけ". 朝日新聞. 2013-03-06. Retrieved 2013-03-06. ^ "ゴラン高原の国連軍21人、反体制派が拘束". 読売新聞. 2013-03-07. Retrieved 2013-03-07. ^ "シリア:ゴランPKOのフィリピン人21人、解放される". 毎日新聞. 2013-03-09. Retrieved 2013-03-10. ^ "هيتو رئيسا لأول حكومة انتقالية بسوريا". Al Jazeera.net. 2013-03-19. Retrieved 2013-03-19. ^ "暫定首相にヒット氏選出＝在米のビジネスマン－シリア反体制派". 時事通信. 2013-03-19. Retrieved 2013-03-19. ^ "Damascus Denies Lebanon Air Strikes". RIA Novosti. 2013-03-19. Retrieved 2013-03-20. ^ "シリアのモスクで自爆テロ イスラム指導者ら42人死亡". 朝日新聞. 2013-03-22. Retrieved 2013-03-22. ^ "عشرات القتلى بتفجير وقصف متبادل بسوريا". Al Jazzera.net. 2013-03-22. Retrieved 2013-03-22. ^ "反体制武装組織指導者が重傷＝シリア". 時事通信. 2013-03-25. Retrieved 2013-03-25. ^ "シリアで大規模自爆テロ、少なくとも15人死亡". 読売新聞. 2013-04-08. Retrieved 2013-04-13. ^ "「アルカイダに忠誠」 シリア反体制過激派がメッセージ". 産経新聞. 2013-04-10. Retrieved 2013-04-10. ^ "イスラエル、再びシリア攻撃か＝地域紛争化も". 時事通信. 2013-05-05. Retrieved 2013-05-05. ^ "シリア反体制派がサリン使用か 国連調査官「強い疑い」". 産経新聞. 2013-05-06. Retrieved 2013-05-06. ^ "国連調査官、シリア反対派による化学兵器使用の容疑あり". 中国国際放送. 2013-05-06. Retrieved 2013-05-06. ^ "NGO: Rebel chief wounded near Damascus". Maan News Agency. 2013-05-09. Retrieved 2013-05-09. ^ "Al-Nusra Front denies chief wounded in Syria". Al Arabiya.net. 2013-05-09. Retrieved 2013-05-09. ^ "Syria rebels battle Hezbollah in Lebanon". Al Jazeera English. 2013-06-03. Retrieved 2013-06-06. ^ "Syrian army 'totally controls' Qusayr". News24. 2013-06-05. Retrieved 2013-06-05. ^ "シリアが正式加盟国に　化学兵器禁止条約". 産経新聞. 2013-10-14. Retrieved 2013-10-26. ^ Danny KEMP (2013-10-23). "英でシリア問題会合、アサド氏退陣で合意". AFPBB News. Retrieved 2013-10-26. ^ "シリア化学兵器、処理地決まらず　ＯＰＣＷ協議続く". 朝日新聞. 2013-11-16. Retrieved 2013-11-17. ^ "シリア化学兵器の国外廃棄、受け入れ先決定が難航か". Reuters. 2013-11-17. Retrieved 2013-11-17. ^ "アルバニア受け入れ拒否　国外処理案宙に浮く　シリア化学兵器全廃". 産経新聞. 2013-11-16. Retrieved 2013-11-17. ^ "シリア化学兵器　アルバニアが処理拒否". 東京新聞. 2013-11-16. Retrieved 2013-11-19. ^ "シリアの化学兵器、次の候補ベルギーも処理否定". 読売新聞. 2013-11-18. Retrieved 2013-11-19. ^ "国連がシリアに支援物資を初空輸". フランス通信社. 2013-12-16. Retrieved 2013-12-16. ^ "シリア内戦の死者、2014年は過去最多の7万6000人". AFPBBNews. フランス通信社. 2015-01-02. Retrieved 2015-01-03. ^ "Arrest of leader of the Islamic Democratic movement in Syria". elaph.com. Retrieved 12 February 2011. ^ "Transfer of activist Ghassan Najar to Adra prison after being referred for trial". free-syria.com. Retrieved 12 February 2011. ^ "Start of the trial exhibits and the Syrian writer Ali Abdullah". free-syria.com. Retrieved 12 February 2011. ^ "Jailed prominent Syrian opposition for seven and a half years". free-syria.com. Retrieved 12 February 2011. ^ "Syrian authorities detain national identity Adnan Mustafa Abu Ammar". free-syria.com. Retrieved 12 February 2011. ^ Taylor, Paul (16 February 2011). "Egypt-Inspired Protests Gain Pace Across Region". Reuters. ^ "Syria arrests opposition leader as protests continue". CNN. 22 March 2011. Retrieved 22 March 2011. ^ "Al Jazeera journalist missing in Syria". Al Jazeera. 2 May 2011. Retrieved 2 May 2011. ^ Preston, Jennifer (9 February 2011). "Syria Restores Access to Facebook and YouTube". The New York Times. ^ York, Jillian. "Unblocking Syria's Social Media". Al Jazeera English. Retrieved 13 February 2011. ^ "President al-Assad Issues Legislative Decree Reducing Mandatory Military Service by Three Months". Syrian Arab News Agency. 20 March 2011. ^ "Syrian mourners call for revolt, forces fire tear gas". Reuters. 19 March 2011. Retrieved 19 March 2011. ^ "Syria pledges reforms after protests". Al Jazeera English. 24 March 2011. Retrieved 24 March 2011. ^ "Syria unrest: Government pledges political reforms". BBC News. 24 March 2011. Retrieved 24 March 2011. ^ "Syria turmoil: Political inmates 'freed' after protests". BBC News. 26 March 2011. Retrieved 26 March 2011. ^ "Assad orders review of Syrian laws". 31 March 2011. Retrieved 1 April 2011. ^ "Assad attempts to appease minority Kurds". 7 April 2011. Retrieved 7 April 2011. ^ "Syria Frees 48 Kurds, Hoping To Ease Grievances". Reuters. 7 April 2011. Retrieved 7 April 2011. ^ "Syrian Kurds to enjoy citizenship rights". 6 April 2011. Retrieved 7 April 2011. ^ "Syria to lift decades-old emergency law". 19 April 2011. Retrieved 19 April 2011. ^ "Syrian uprising spread after troops kill at least five". The Guardian. 22 March 2011. Retrieved 22 March 2011. ^ "Syria Frees 80-Year-Old Former Judge in Amnesty". Reuters. Retrieved 8 March 2011. ^ "12 rights groups in Syria demand end to emergency". AFP. Retrieved 8 March 2011. ^ "هيثم المالح .. يوجه رسالة إلى شباب الثورة السورية". YouTube. Retrieved 12 March 2011. ^ "Opposition leader Ribal Al-Assad is optimistic to changes in Syria". elaph.com. Retrieved 16 February 2011. ^ "Assad's exiled cousin warns Syria risks civil war". NOW Lebanon. 5 April 2011. Retrieved 20 April 2011. ^ "EU condemns 'unacceptable' repression in Syria". Middle East Online. 22 March 2011. Retrieved 22 March 2011. ^ "UN chief slams Syria's crackdown on protests". Al Jazeera. 18 March 2011. Retrieved 27 June 2011. ^ Alexandra kirk (25 March 2011). "Australia advises citizens not to travel to Syria". abc.net.au. Retrieved 26 March 2011. ^ "Canada condemns violence in Yemen, Bahrain, Syria". AFP. 21 March 2011. Retrieved 22 March 2011. ^ Foreign Affairs and International Trade Canada (24 April 2011). "Canada Condemns Violence and Offers Consular Advice to Canadians Regarding Syria". international.gc.ca. Retrieved 22 June 2011. ^ Lebanon News. "France condemns violence against protesters in Syria". Retrieved 17 March 2011. ^ "France Urges Syria To Make Immediate Political reforms". Reuters. 23 March 2011. Retrieved 23 March 2011. ^ Staff (24 March 2011). "Germany urges Syria to halt violence, launch talks". Reuters. Retrieved 25 March 2011. ^ "Syria cannot ignore "wind of change," Greece says". AFP /NOW Lebanon. 24 March 2011. Retrieved 25 March 2011. ^ "Maliki voices Iraq's support for Syria". NOW Lebanon. Retrieved 3 April 2011. ^ "Intervew – West should treat Syria, Iran like Libya-Israel". Reuters. 24 March 2011. Retrieved 25 March 2011. ^ "מהומות בסוריה: חשש בצה"ל מהתגרות של אסד – פוליטי מדיני – הארץ". Haaretz (in Hebrew). 24 March 2011. Retrieved 23 April 2011. ^ 08:04 14.08.2007 מאת: עמוס הראל 0 (14 August 2007). "דאגה במערכת הביטחון בנוגע לאפשרות למלחמה עם סוריה; הערכה: בקרוב יתבהר המצב מולה – שוק ההון – דה מרקר TheMarker". Themarker.com. Retrieved 23 April 2011. ^ "シリアにおけるデモ隊と治安当局との衝突について". 日本国外務省. Retrieved 2011-07-01. ^ "Mikati discusses regional developments with Assad". NOW Lebanon. 31 March 2011. Retrieved 25 June 2011. 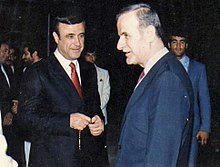 ^ "Sleiman voices importance of Syrian stability". NOW Lebanon. 31 March 2011. Retrieved 25 June 2011. ^ "México condena violencia contra civiles en Siria". El Universal. 23 April 2011. Retrieved 25 June 2011. ^ "Sykehus tok imot 25 døde demonstranter i Syria". NRK. 24 March 2011. Retrieved 25 June 2011. ^ "Qatari emir voices Qatar's support for Syria". NOW Lebanon. 3 April 2011. Retrieved 25 June 2011. ^ "Russian president voices support for "Syrian reforms"". NOW Lebanon. 6 April 2011. Retrieved 25 June 2011. ^ "Saudi king expresses support to Syrian president". Xinhuanet. 28 March 2011. Retrieved 28 March 2011. ^ "湾岸協力会議、シリア国民連合を承認 アラブ連盟も". AFPBB News. 2012-11-13. Archived from the original on 2013-05-02. Retrieved 2013-06-30. ^ "「シリア反政府勢力に武器を」". NHKニュース. 日本放送協会. 2013-05-02. Archived from the original on 2013-05-02. Retrieved 2013-05-02. ^ "Syria's Assad receives support of Sudanese counterpart". NOW Lebanon. 6 April 2011. Retrieved 25 June 2011. ^ SEVİL KÜÇÜKKOŞUM (22 March 2011). "Turkey anxious over protests in Syria". Hürriyet Daily News. Retrieved 23 March 2011. ^ Sabel, Robbie (26 April 2011). "Obama, Erdogan: Syrian gov't must end violence immediately". The Jerusalem Post. Retrieved 8 May 2011. ^ "Erdogan and Syrian Government". YouTube. Retrieved 8 May 2011. ^ "UAE reaffirms support for Syria". NOW Lebanon. 29 March 2011. Retrieved 25 March 2011. ^ Kessler, Oren (24 March 2011). "'More than 100 killed in Syrian anti-government rallies'". The Jerusalem Post. Retrieved 25 March 2011. ^ "Obama Administration Condemns Syrian Violence Against Protests". Bloomberg. 18 March 2011. Retrieved 25 June 2011. ^ Gaouette, Nicole (28 March 2011). "Clinton Says U.S. Won't Intervene in Syria, Sees Progress in Libya Fight – Bloomberg". Bloomberg. Retrieved 10 April 2011. ^ "Clinton: No military action in Syria for now – Face The Nation – CBS News". Cbsnews.com. 27 March 2011. Retrieved 10 April 2011. ^ "Obama Condemns 'Abhorrent Violence' of Syrian Gov't". Reuters (via Ynetnews). 9 April 2011. Retrieved 9 April 2011. ^ "Venezuela's Chavez offers supports to Syrian leader amid protests, blames US for unrest". theguardian.pe.ca. 26 March 2011. Retrieved 27 March 2011. ^ "北朝鮮戦闘機パイロット 50人以上シリア入りか". テレビ朝日. 2012-10-16. ^ "Rights Groups Condemn Syria's Violent Crackdown On Protesters". RFE/RL. 21 March 2011. Retrieved 26 June 2011. ^ "Syria: Government Crackdown Leads to Protester Deaths". Human Rights Watch. 21 March 2011. Retrieved 26 June 2011. ^ "Protests in Syria's Daraa city, journalists banned". Deutsche Presse-Agentur. 25 March 2011. Retrieved 26 March 2011. ^ Shavit, Uriya. The new imagined community: global media and the construction of national and Muslim identities of migrants Pg. 106. 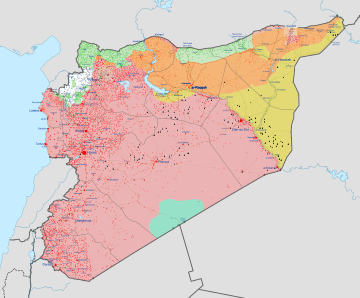 ^ "To survive, Assad must contain majority Sunni unrest before it infects army". DEBKAfile. 26 March 2011. Retrieved 26 March 2011. ^ "قوى المعارضة في سوريا". Al Jazeera. Retrieved 10 March 2011. ^ "معتقلو الرأي في سوريا". Al Jazeera. Retrieved 9 March 2011. ^ "ضيق لاستبعاد سياسيين من عفو سوريا". Al Jazeera. Retrieved 11 March 2011. ^ "ر - سوريا .. الإصلاح والحرية". Al Jazeera. Retrieved 17 April 2011. ^ "Now let's have a no-fly zone for Syria and Yemen". The Daily Telegraph. 23 March 2011. Retrieved 23 March 2011. ^ "「国家として崩壊寸前」　国連調査委が報告書　「戦争犯罪の横行」安保理決議の無履行を非難". Retrieved 2016-04-04. ^ "シリア食料事情調査　400万人が食料を十分に生産・購入できず ～FAO/WFP共同報告書は、紛争が続けば2014年シリアの食料見通しは深刻な状態に陥ると予測～". Retrieved 2016-04-04. ^ "シリア紛争から5年　－国内に渦巻くカオス、外に溢れだすトラウマ". Retrieved 2016-04-04. ^ "Medical society details Syrian health crisis and efforts to help". Retrieved 2016-04-04. ^ "シリアの6つの世界遺産、全て「危機遺産」に指定 ユネスコ". Retrieved 2016-04-04. ^ "【解説】イスラム国に包囲されるシリアのクルド人（１）". アジアプレス・ネットワーク. Retrieved 2016-04-04. ^ "イラク第2の都市モスルを武装勢力が掌握". AFPBBNews. フランス通信社. 2013-06-10. Retrieved 2014-06-10. Lawson, Fred Haley, ed (2009). Demystifying Syria. London: Saqi. ISBN 9780863566547. Wright, Robin (2008). Dreams and Shadows: The Future of the Middle East. New York: Penguin Press. pp. 212–261. ISBN 1594201110. Ziadeh, Radwan (2011). Power and Policy in Syria: Intelligence Services, Foreign Relations and Democracy in the Modern Middle East. London: I.B. Tauris. ISBN 9781848854345.